On 2 July 2011, the Islamic political organization, Hizb-ut Tahrir (The Party of Freedom), staged a last-minute demonstration in Hebron after the Palestinian Authority (PA) blocked a planned demonstration in Ramallah. Over 1000 demonstrators descended upon the Palestinian-controlled area of the city in the late afternoon. Subsequent clashes with Palestinian police—with the protestors throwing stones and police responding with tear gas and shots fired into the air—resulted in about thirty casualties, including one person who was hospitalized. Bystanders, including four CPTers, watched as Palestinian police, dressed in full riot gear, brutally pushed back onlookers in an attempt to clear the area. Dismayed by the violence one Palestinian bystander remarked of the Palestinian police, “They are not humans, they are Daytons,” referring to General Keith Dayton who, as the US Security Coordinator for the Palestinians, is the one responsible for the training of the PA security forces. A CPTer positioned herself between the baton-wielding police and bystanders. When the police commander approached, she scolded him for ordering his officers to behave in such a violent fashion. He was apologetic but defiant, and invited members of CPT’s Hebron team to meet with him at a later date.The demonstration marked the ninetieth anniversary of the fall of the last caliphate. 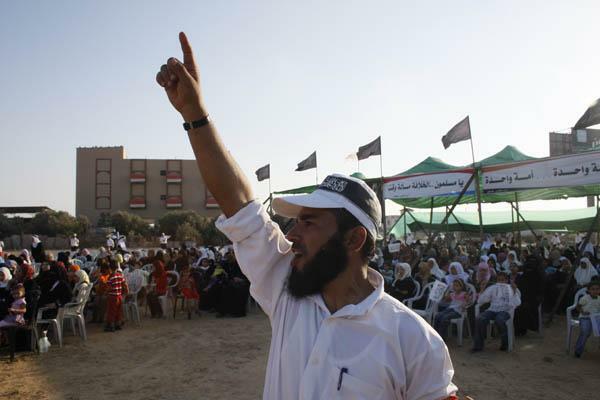 The Hizb-ut Tahrir is committed to re-establishing the caliphate, or Islamic state, across the Muslim world. BEIRUT: A delegation of Hizb Ut-Tahrir in Lebanon discussed Monday with members of Hezbollah’s politburo the recent regional developments and particularly the Arab popular uprisings. A statement released by fundamentalist party Hizb Ut-Tahrir said the head of the party’s administrative committee Mohammad Jaber and member of the telecommunication committee Saleh Salam held talks with Hezbollah politburo members Sheikh Abdel-Majid Ammar and Mohammad Saleh. Ever since the uprisings started in Syria in mid-March Hizb Ut-Tahrir has been organizing protests against the Syrian government in Lebanon on a weekly basis. A version of this article appeared in the print edition of The Daily Star on October 18, 2011, on page 3. 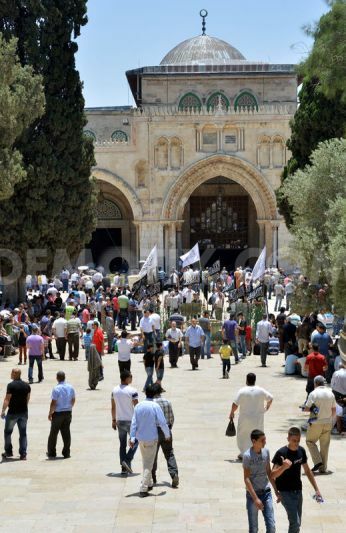 Palestinian supporters of Hizb ut-Tahrir or the Islamic Liberation Party, chant slogans and wave black and white flags with the religous writing “There is no God but God, and Mohammed is his prophet” during a rally in the In the Al Aqsa Mosque. 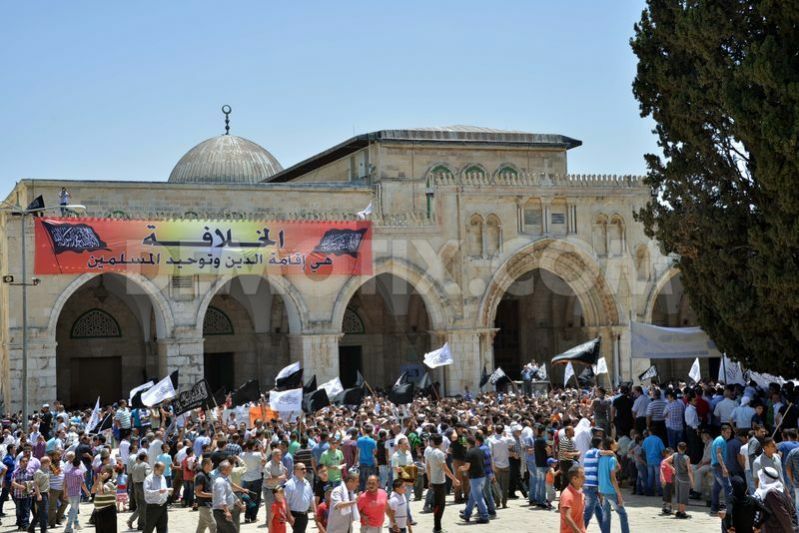 Palestinian supporters of Hizb ut-Tahrir or the Islamic Liberation Party, chant slogans and wave black and white flags with the religous writing “There is no God but God, and Mohammed is his prophet” during a rally in the In the Al Aqsa Mosque in Jerusalem The Islamic Liberation Party, which calls for the return of the Islamic caliphate and the establishment of an Islamic states, has no military power in the Palestinian territories and its goal is to join all Muslim countries under one nation. Posted: April 22, 2011 in HuT - Palestine, News About Hizb ut-Tahrir, PLA & PLO: "be despised therein and do not speak!" The secret documents and minutes of the negotiations are gushing forward like the flood of the dam. They expose the [Palestinian] Authority and the [Palestinian] “Liberation” Organization for all to see, while uncovering the false nature of their media heroics and lying, wrong stances. They look for “creative” solutions for Masjid al-Aqsa, and present to the Jews the biggest “Yerushalayim” in history, on a platter. They exchange, with the enemy occupier, one parcel of usurped land for another similar parcel of usurped land, and behind the scenes they abandon the majority of al-Quds, including its oldest districts – no matter how long they claimed they were holding firm onto it. Their security coordination ensures the safety of the enemy occupier, and hands over our sons so they may be imprisoned and killed; they target the masajid and the Jumu’ah khutbahs, to please America and the Jews… the list goes on. 1. Everything these documents reveal only emphasizes what we said the day that the [Palestinian] Liberation Organization was launched, in which we specifically warned the people of Palestine and the Muslims as a whole of the goal for which the PLO was established: recognition of the Jewish state and surrendering the majority of Palestine. Likewise they emphasize what we have said regarding the Palestinian Authority, since it was formed and until today: it will complete the work that the PLO started, adding to this protecting the Jewish entity and its settlers, while concentrating killing, destruction and expulsion on the people of Palestine. 2. The simple fact of designating the issues with the name “the final settlement” means that the PLO and the PA intend, with premeditation and awareness, to hand a document of surrender of the majority of Palestine over to the Jewish occupation. 3. Whosoever accepts negotiation over a single part of Palestine is not hurt by negotiation over any another part, which emphasizes the foolishness and criminality of any negotiations on Palestine and her people, as well as its status as betrayal of Allah, His Messenger and the Muslims. 4. The steps taken by the PLO and the PA regarding the Palestinian issue do not represent the interests of the Islamic Ummah, her deen or her sharee’ah; instead they represent the interests of the colonialist kuffar. 5. We emphasize once more that the land of Palestine is a waqf [permanent trust] for the Muslims of the entire world, since the beginning of the mission of the Prophet صلى الله عليه وسلم until Yaum ul-Qiyamah. No man possesses the right to surrender a hand span of it, whether PLO, PA or even the Palestinian people as a whole, who are less than 1% of the Muslims. 6. The issue of Palestine currently rests in the hands of a small gang, distant from the culture of the Ummah, who give them not the slightest regard. Instead the colonialist Kuffar – whether Jews, Americans, Europeans or Russians – are pleased with them, and attempt to confer on them international legitimacy in order to end the issue of Palestine through them. This is one of the greatest operations of political deception and misguidance in the history of the Islamic Ummah. Indeed it is waajib (obligatory) upon the people of Palestine and the Muslims generally, particularly the influential scholars, politicians, academics and thinkers to say openly to the men of the PLO and the PA, “take your hands off Palestine, you don’t represent anyone except yourselves! Palestine, the blessed land, is not a property of you or your fathers. Who are you, and who entrusted you with the right to surrender a speck of her to the Jewish occupiers?” You must raise your voices, because silence over the practices of the PA and the PLO towards the Palestinian issue is a great sin, which Allah will account you for on Yaum ul-Qiyamah. So raise your voices and fear none but al-Azeez al-Jabbar. BETHLEHEM, West Bank, Aug. 4 (UPI) — The Palestinian Authority has released 23 Hizb ut-Tahrir detainees. Hizb ut-Tahrir maintains that other members remain in custody. 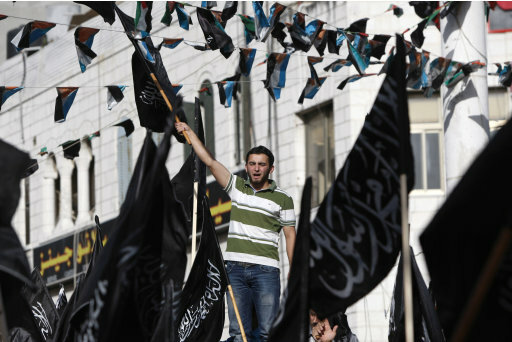 Ma’an news agency reported Wednesday that the PA released all its Hizb ut-Tahrir (Arabic for “Party of Liberation”) Qalqiliyah members on bail Tuesday, 10 days after they were arrested. The HuT members planned to commemorate the collapse of the Islamic caliphate, which was abolished by Turkey’s President Kemal Ataturk in 1924, after the PA banned the activities in the West Bank. HuT’s program is to re-establish the caliphate, asserting that its methods are non-violent. HuT operates clandestinely in more than 40 countries but it is banned throughout the Middle East, Russia, the post-Soviet Central Asian states and Germany, which is proscribed the group because of its virulent anti-Semitism. According to the Hizb al-Tahrir Media Office, Palestinian security apparatuses are still holding dozens of their supporters from the village of Biddiya in the Salfit Governorate and in other areas of the West Bank. 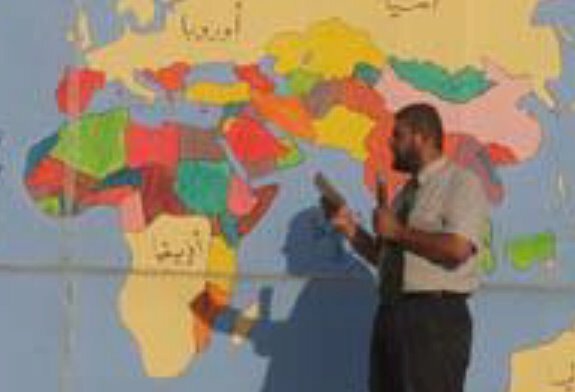 A true pan-Islamic organization, HuT has deep roots in the Middle East, as it was founded in Jerusalem in 1953 by a Judge of the Shari’a Appeals Court in Jerusalem, Muslim religious qadi Taqiuddin al-Nabhani, who studied at Cairo’s al-Azhar University. HuT was illegal from the outset, as it didn’t receive a permit from the Jordanian government to operate. After Nabhani’s death in 1979 Jordanian Abad al-Qadim Zalum took over as HuT’s leader until his own death in 2003. HuT’s current leader is Ataa’ Abu Rushta, a Jordanian-Palestinian. HuT says only that he “is in the Muslim world,” with many analysts believing that he is in somewhere Lebanon. The identities of nearly all other top HuT leaders are unknown. Nabhani rejected Western political structures, entitling one of his books “Democracy: the Law of Infidels.” Nabhani’s philosophy was to re-establish the pan-Islamic Caliphate and reunite the Muslim faithful in a recreation of the Islamic community as it was under the Prophet Muhammad’s immediate successors. Al-Nabhani’s writings remain very influential. He detested “depraved democracies” imposed by the West on Muslim nations, advocating instead “a single state over the entire Muslim world.” HuT currently operates out of London. In the wake of the July 7, 2005, London bombings Britain considered banning the group but eventually demurred. HuT consistently claims to be an entirely peaceful political movement dedicated to re-establishing the caliphate. Like al-Qaida, HuT uses the Internet and digital technology to propagate its version of globalization: worldwide Shariah government. The source of its finances is obscure, While each HuT member is required to tithe 10 percent of his income to the group, other sources of income remain unknown. 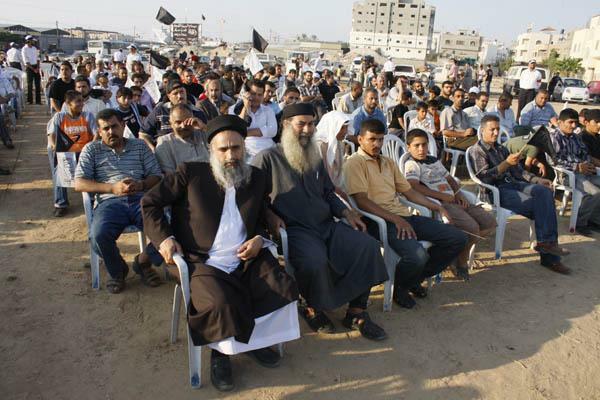 GAZA CITY (Ma’an) — The Islamist movement Hizb Ut-Tahrir on Thursday slammed Hamas, saying the party was giving up its principals. Hizb Ut-Tahrir (Liberation Party) issued a statement following a rare news conference held by Hamas Prime Minister Ismail Haniyeh in Gaza on Wednesday. The party said Hamas was heading toward the same track as Fatah and the Palestinian Authority, turning from armed struggle to negotiations with Israel, and ceding most of Palestine. Haniyeh said Wednesday that Hamas would accept the creation of a Palestinian state in the West Bank and Gaza. The Gaza Prime Minister said his government would respect the results of a referendum on any peace deal agreed in negotiations with Israel, in line with the 2007 Mecca agreement that established the Hamas-Fatah unity government. Hizb Ut-Tahrir said Haniyeh’s statements confirmed information revealed in a US diplomatic cable released by the whistleblowing group WikiLeaks. In a document originating from the US embassy in Doha, Qatar’s Foreign Minister Sheikh Hamad bin Jassim Al Thani is reported to have said Hamas leaders were ready to recognize Israel. According to the cable, Al-Thani said Hamas leaders realized they would have to time the announcement carefully, as their supporters were not ready for the change.